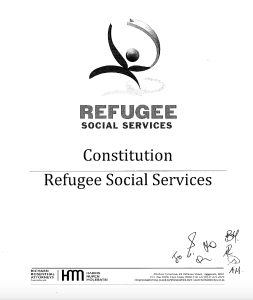 Refugee Social Services is a registered Public Benefit Organisation. 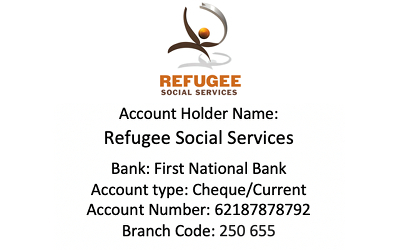 This implies that donations made to Refugee Social Services are tax deductible in the hands of the donor in terms of and subject to limitations prescribed under section 18(a) of the Act. 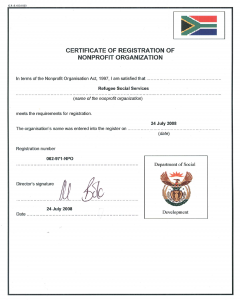 A constitution for a nonprofit organisation is very similar to the bylaws that govern the actions of its board of directors. Like bylaws, the constitution depicts the rules by which the entity will operate and the restrictions, powers, and duties of its officers and board members. MCC, is a worldwide ministry of Anabaptist churches, shares God’s love and compassion for all in the name of Christ by responding to basic human needs and working for peace and justice. RPC is a project of the Archdiocese Durban responsible for handling all matters affecting all foreign nationals in the area of the Archdiocese and beyond. The project was started in 1999 and gained momentum in 2002 when it was allocated a full time chaplain. 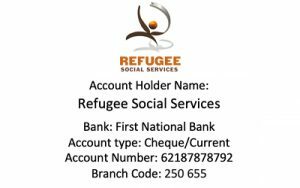 CoRMSA’s main objectives are the promotion and protection of the rights of asylum seekers, refugees and international migrants. We operate at the national, regional and global level with strategic support to our members at local and provincial levels. Our mission is to provide high-quality, free English lessons to all who need them, delivered by qualified and trained teachers. We also hold short courses according to need in Business English, Academic English and English for Tourism. The Voices of Women (Amazwi Abesifazane) is a decade-long project that began as the brainchild of Andries Botha who, after attending the Truth and Reconcilliation (TRC) hearings in South Africa, developed a creative methodology as a means for women’s memory to be recounted and held in trust as part of the memory archive of South Africa for future posterity. It is a place where people of every race, culture, class, age, nationality, language and religion should feel welcome and at home, confident that their human dignity is valued and honoured. The particular purpose of the Centre is to provide an enabling environment for people and organisations committed to social transformation. It is hoped that their efforts will be strengthened by the networking, co-ordination and sharing of resources promoted in this environment. Inspired by our history, the Constitution and international human rights standards, the LRC is committed to a fully democratic society based on the principle of substantive equality. The LRC seeks to ensure that the principles, rights and responsibilities enshrined in our national Constitution are respected, promoted, protected and fulfilled. Join us at our latest events! Volunteering connects you to others!.